Relays come in a variety of form factors, styles, and technologies. Depending on your application, only one relay type may be suitable. In other cases, multiple relay types may be appropriate. By understanding the strengths and weaknesses of the different relays, you should be able to pick the one that is best suited for the job at hand. Note: Although many of the conclusions in this article apply to all relay applications, it discusses specifically what factors to consider when looking at the different types of relays that are used on switch modules targeted at automated test equipment (ATE) applications. The comparisons made here are between relays with similar voltage, current, and power ratings in the form factors that are found in typical switch modules. The following sections explain how these relays operate and identify their relative strengths and weaknesses. Electromechanical relays are perhaps the most widely used relays in ATE applications today. They are made of a coil, an armature mechanism, and electrical contacts. When the coil is energized, the induced magnetic field moves the armature that opens or closes the contacts. See Figure 1. Figure 1. 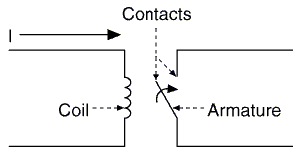 Electromechanical relay: Current through the coil creates a magnetic field that moves the armature between the contacts. Electromechanical relays support a wide range of signal characteristics, from low voltage/current to high voltage/current and from DC to GHz frequencies. For this reason, you can almost always find an electromechanical relay with signal characteristics that match given system requirements. The drive circuitry in electromechanical relays is galvanically isolated from the relay contacts, and the contacts themselves are also isolated from one another. This isolation makes electromechanical relays an excellent choice for situations where galvanic isolation is required. The contacts on electromechanical relays tend to be larger and more robust than some other relay types. The larger contacts give them the ability to withstand unexpected surge currents caused by parasitic capacitances present in your circuit, cables, etc. An unfortunate tradeoff, however, is that the larger contacts require larger package sizes, so they cannot be placed as densely on a switch module. While the mechanical construction of electromechanical relays allows for much flexibility in switching capability, they have one important limitation: speed. When compared to other relays, electromechanical relays are relatively slow devices -- typical models can switch and settle in 5 to 15 ms. This operating speed may be too slow for some applications. Electromechanical relays typically have shorter mechanical lifetimes than other types. Advances in technology have increased their mechanical lifetime, but electromechanical relays still do not have as many possible actuations as a comparable reed relay. As with any relay, the amount of power being switched and other system considerations can have a significant impact on the overall lifetime of the relay. In fact, the mechanical lifetime of an electromechanical relay may be smaller than that of a reed relay, but its electrical lifetime under a similar load (particularly a capacitive load) might decrease at a much slower rate than that of a reed relay. The larger, more robust contacts of an electromechanical relay may often outlast a comparable reed relay. Electromechanical relays are available in both latching and non-latching varieties. Non-latching relays require continuous current flow through the coil to keep the relay actuated. These are often used in applications where the relay must switch back to a safe state in the event of a power failure. Latching relays use permanent magnets to hold the armature in its current position, even after the drive current is removed from the coil. For very low-voltage applications, latching relays are preferable because the lack of coil heating minimizes thermal electromotive force (EMF), which can affect your measurements. Electromechanical relays are used in a wide variety of switch modules. Their robustness makes them well suited for many applications, particularly where switching speed is not the highest concern, and their versatility means you can use them on all types of switching configurations including general purpose, multiplexers, and matrices. Reed relays, like electromechanical relays, have physical contacts that are mechanically actuated to open/close a path. For reed relays, however, the contacts are much smaller and lower mass than those used in electromechanical relays. Dry reed relays are made of coils wrapped around reed switches. The reed switch is composed of two overlapping ferromagnetic blades (called reeds) hermetically sealed within a glass capsule that is filled with an inert gas. The reeds have contacts on their overlapping ends. When the coil is energized, the two reeds are drawn together such that their contacts complete a path through the relay. When the coil is de-energized, the spring force in the reeds pulls the contacts apart. See Figure 2. Figure 2. 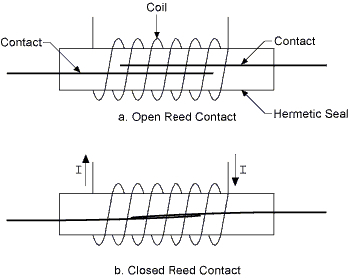 Dry reed relay: Current through the coil creates a magnetic field that draws the two reed contacts together. Because of the smaller, less massive contacts and the different actuating mechanism, a reed relay can switch about 10 times faster than an electromechanical relay with equivalent ratings. The reed relay's mechanical lifetime is also much higher than an electromechanical relay. The tradeoff, however, is that the smaller contacts on the reed relay make it much more susceptible to damage from arcing when closing a circuit. When an arc jumps across the contacts, it can melt a small section of the contact surface. If the contacts are still closed when the molten section re-solidifies, the contacts may weld together. The spring force in the reeds is often not sufficient to mechanically break the weld after the drive current has been turned off, which renders the relay unusable. Electromechanical relays may also be damaged from arcing, but the energy required to cause this is much higher. Because reed relays are so susceptible to contact damage, inrush currents from system capacitance can be particularly dangerous. Inrush currents can be controlled with a series impedance, such as a resistor or ferrite, between the relay and the capacitance. Any capacitance in the system can contribute to inrush currents, whether it is in a reactive device under test or from a shielded cable. The ferromagnetic materials from which reed relays are constructed cause them to have a higher thermal EMF than an equivalent electromechanical relay. Reed relays are thus not ideal for extremely low-voltage applications as their thermal EMF may introduce enough noise to cause errors in your measurements. The small size and high speed of the reed relay make it a great choice for many switching applications. Reed relays are more often found on matrix and multiplexer modules than general-purpose modules. SSRs are constructed using a photo-sensitive MOSFET device with an LED to actuate the device. See Figure 3. Figure 3. Solid-state relay (SSR): Light from the encapsulated LED actuates the photo-sensitive MOSFET and allows current to flow through it. SSRs are a faster alternative to electromechanical relays because their switching time is dependent on the time required to power the LED on and off -- approximately 1 ms and 0.5 ms, respectively. Because there are no mechanical parts, their life expectancy is higher than an electromechanical or reed relay. SSRs are useful for high-voltage applications because the LED actuation does provide a galvanic isolation barrier between the control circuitry and the MOSFET. Because the MOSFET is doing the switching, however, there is no galvanic barrier between its contacts. 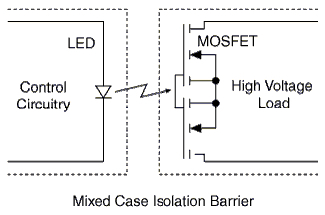 When there is no gate drive on the MOSFET, the drain-source channel on the MOSFET has a very high resistance providing the disconnection between the contacts. Because the connection is made via a transistor instead of physical metal like in electromechanical and reed relays, the contact resistance for an SSR is greater. Although new technologies are continually improving the contact resistance of SSRs, it is still not uncommon to find them in production today with resistances of 100 Ohms or more. SSRs are not as robust as electromechanical relays. Much like reed relays, they are highly susceptible to surge currents and damage when used at signal levels above their rating. Although there are no metal contacts to weld, damage to the MOSFET can render the relay unusable. SSRs are common on matrices and multiplexers. Like SSRs, FET switches are not mechanical devices. FET switches use a series of CMOS transistors to implement the switching. Unlike SSRs, the control circuitry drives the gates of the transistors directly instead of driving an LED. Direct drive of the transistor gate allows for much faster switching speeds because the power-on/power-off time of the LED is not an issue. In general, FET switches are the fastest of the switches discussed here. Also, because there are no mechanical parts or LEDs in the packaging, FET switches can be very small. One major drawback of the FET switch, however, is that it lacks a physical isolation barrier and thus may only be used with low-voltage signals. Because they are FET based, FET switches share many of the advantages and disadvantages of SSRs. For example, they have a higher switching lifetime but also a much higher path resistance than an electromechanical or reed relay. FET switches are most often used in multiplexer configurations for higher speed, low-voltage applications. Electromechanical relays provide a good all-around solution, although they have limitations in package size, switching speed, and mechanical lifetime. Reed relays improve on package size, density, and speed but are less robust in situations where surge currents may be present. SSRs are a nice alternative to mechanical relays but have higher path resistances and are not fully isolated between the contacts. FET switches provide a fast, low-cost solution but have the limitation of only working with low voltages. For any application, consider all of the system parameters before choosing a given relay type. Using this information will allow you to make the appropriate tradeoffs for your application.